Penda Learning's class and student leaderboards were designed with gamification in mind. Gamification works by incorporating 5 common mechanisms such as earning points, rewarding achievement using badges, progressing through various levels, organizing players by rank using leaderboards, and offering specific challenges to complete. This drives student engagement by accelerating feedback cycles, establishing clear goals and rules for playing, creates a compelling narrative, and setting challenging by achievable tasks for students to complete. CLASS LEADERBOARD - Penda Learning's class leaderboard inspires monthly competitions among classes using Penda within the school. 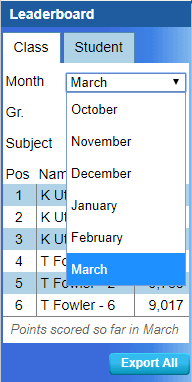 At the beginning of each month, the class leaderboard automatically resets back to zero, ensuring it is ready for competition challenges among class periods for the given month. Based upon teacher-user recommendations, we've recently made an enhancement to the leaderboard by adding a 'month' drop-down field. Now, teacher and school administrator users will not only see points accumulated for the current monthly competition, but can select previous months of which competition point totals are archived. STUDENT LEADERBOARD - Similar to the class leaderboard enhancement, a 'month' drop-down field was also added. While the student leaderboard continues to show points earned from August 1 to present (it does not reset to zero at the beginning of each month), snapshots of points accumulated month over month are archived and available.